ABOVE THE LAW--that's what this picture clearly tells. 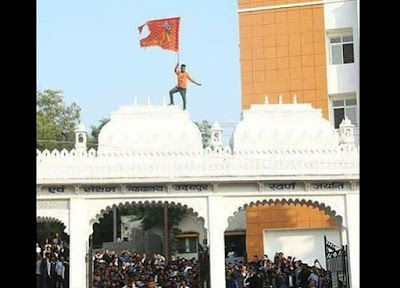 Saffron fanatics ran riot in Udaipur court, attacked police, injured 31 officials and personnel, pelted stones, barged into court and one of them unfurled his flag on the court. They are supporting a monster--Shambhu Bhawani alias Shambhu Regar, who hacked an innocent man to death, and burnt him, got video shot and it was shared on social media. Entire nation saw how the radicalised terrorist committed the murder of a Muslim man, just because of his religion. Throughout the year--2017, Muslims all over India have been killed by cow vigilantes and fanactis linked to the right-wing Hindutva ideology. The picture of Shambhu Bhawani killing Afrazul was equated with that of a man killed by an ISIS terrorist in Syria. But there is a difference. India is not war-torn and it is still a democracy. That's India in 2017. No bullets or even rubber pellets were fired when the fanatics supporting Shambhu Bhawani went on rampage. There is open support being expressed in public for the person involved in the monstrous act. Further, donations have been collected and money is being sent for help for Shambhu. 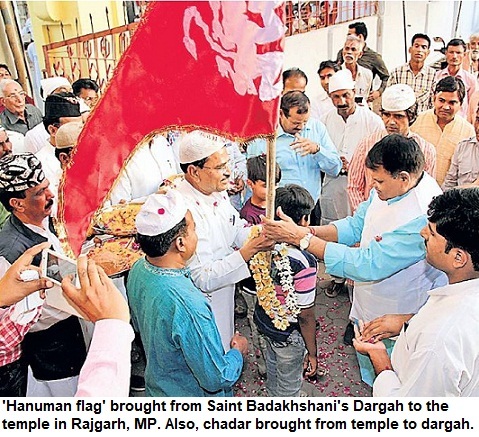 Is this the India, our founding fathers dreamt of? Why there is no strong condemnation of this brazen killing and the manner in which support is being extended to the murderer?